I came across this banner in a coffee shop just opposite Masjid Kassim in Kembangan area, Singapore. Even though I have been living in Singapore for more than 7 years, the words on the banner immediately caught my attention as a Muslim with Indonesian root. The title is MUSLIM FOOD and followed with list of menus below: LONGTON, MEESIAN, MEE SOTO, MEE REBUS, SOTO AYAM, NASI LEMARK, NASI PANDANG. This supposed to be LONTONG. The 'lontong' itself is actually is a kind of 'rice cake'. It serves as the main source of carbohidrate in the main course. Just like plain rice or bread. In today's Singapore term, LONTONG refers to a dish of 'rice cake' served with coconut gravy and egg. In Indonesia, if you ask for LONTONG, you will get only the 'rice cake'. To get a complete set, you must ask for 'Lontong Kari (curry)'. This supposed to be MEE SIAM, or noodle cooked in Siamese style. Mee Siam was originally a Thai dish of noodles made from rice flour noodles (vermicelli) and served in a light and piquant gravy made from tamarind juice and dried shrimp, and served with toppings such as fresh calamansi, tiny cubes of dried beancurd, chives and slices of boiled egg. Hmm... sounds closed enough to LEXMARK the famous computer printer brand isn't it? Actually it refers to NASI LEMAK. Nasi = rice and Lemak = fat or grease. Nasi Lemak made of rice that cooked in coconut milk which produces tasty grease. The set comes as a platter with cucumber slices, small dried anchovies (ikan bilis), roasted peanuts, stir fried water convolvulus (kangkong), hard boiled egg, pickled vegetables (achar) and hot spicy sauce (sambal). I am quite sure they want to say NASI PADANG. Nasi means rice and Padang is a place in Sumatra Island - Indonesia, where is famous for it's variety of spicy foods including fish, meat, chicken, and vegetables. The style had become famous in Singapore and Malaysia even though the taste can't be compared with the authentic Padang foods found in Indonesia. OK, now you must be wondering what is the 5th mistake since that's all in the menu? You might be surprised but actually those are NOT really Muslim Food. Muslims are required to eat HALAL food. Halal means "permissible". Not only it must not contain pork or alcohol etc. but the way to prepare and to get the food must also be "permissible". For example, halal food will not be considered halal anymore to us if we get it by stealing, or to buy it using money that came from ilegal sources (gambling, stealing, corruption, bribery, etc). So what are MUSLIM FOODs? In this case, KFC, McDonald, Delifrance, Seoul Garden, Ramen Ten can also be considered MUSLIM FOOD because they obtained HALAL certificate from the local Muslim authority. So, what is the best title to describe the menu above? What about Malay Food? Maybe that's more appropriate. mistakes? i dun think so. If that was intentional (memang disengaja), why not they tweak Mee Soto, Mee Rebus and Soto Ayam to become Mee Shotoh, Mee Rebush and Shotoh Ayan ? "...as a Muslim with Indonesian root." This should read, "...as a Muslim with Indonesian roots." "The title is MUSLIM FOOD and followed with list of menus below:" First, "followed by" is the proper idiom in English, not "followed with". Next, "list" should have "a" before it. Third, "menus" refers to multiple lists of foods (most likely from different restaurants). On the sign we only see one single menu, not a list of menus. "I don't know how many mistakes you had spotted, but I had identified 5 mistakes:" This should read, "I don't know how many mistakes you spotted, but I have identified 5 mistakes:"
"carbohidrate" should be spelled, "carbohydrate". "Hmm... sounds closed enough to LEXMARK the famous computer printer brand isn't it?" This sentence is a real mess! First of all, it should read, "...sounds close enough..." not "closed enough". Next, there should be a comma after "LEXMARK". Last, "isn't it" is way out of place. Isn't what, what? Using "isn't" in this case is wrong as it must refer to 'something that is', which does not exist in this sentence. "...Padang is a place in Sumatra Island - Indonesia, where is famous for it's variety of spicy foods..." The "where" should be "which", and the "it's" is also wrong. "It's" is either a conjunction ("it is") or possessive, or owning something. The "its" that should be used here is the neutral of "his" or "her", and is therefore not possessive. "The style had become famous in Singapore and Malaysia even though the taste can't be compared with the authentic Padang foods found in Indonesia." The first word should be "This", not "The". "had" should be "has" as it is still famous. "had" implies that it once became famous but is no longer famous. "OK, now you must be wondering what is the 5th mistake since that's all in the menu?" Technically, this should not have a question mark at the end since it's a statement, not a question. "You might be surprised but actually those are NOT really Muslim Food." "Food" should not be capitalized, as it is not a proper name or noun. "Not only it must not contain pork or alcohol..." should be, "Not only must it not contain pork or alcohol..."
"For example, halal food will not be considered halal anymore to us if we get it by stealing, or to buy it using money that came from ilegal sources..." There is a disagreement of tenses here with "will" and "came". In fact the "will" should be conditional (on the condition that the food came from such sources). "Will" should be "would". Also, â€œilegalâ€ should be spelled, â€œillegalâ€. "Most Singaporean are really confused between race and religion :)" "Singaporean" should be "Singaporeans", or plural. 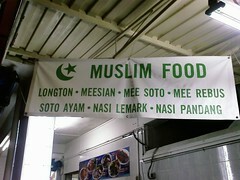 Last, I wonâ€™t count this as a mistake, but â€œMuslim foodâ€ made me laugh as food canâ€™t have a religion. â€œHalal foodâ€ is much more appropriate. I look forward to editing your next post! I sincerely thank you to anonymous for the corrections. Thank you for editing my post. I agree that the title should be Confused Indonesian, not because of my 'casual English' but because I was the one who confused with the facts on how some Singaporeans name the food and use race and religion interchangeably. So, may I request to the site owner to change this article to "Confused Indonesian (was: Confused Singaporean". I will keep on writing and appreciate your willingness to edit my future articles. Not many bloggers could enjoy this kind of God's created Spell & Grammar checker, so once again I thank you so much, whoever you are. But I totally agree with you about how Singaporeans use race and religion interchangeably and how it's odd. But even worse is non-Singaporeans who use Malay and Malaysian interchangeably (the race and the country). But there is one thing we can all agree on: I bet we both like Malay/Indonesian food!